Hello, can I ask the team to pay attention to the numerous errors and shortcomings of working with the gui? I encounter a serious obstacle when creating complex mods. A poorly working gui is a big problem. If you don’t know what bugs we’re talking about, I can provide a complete list with an explanation. Many of them are associated with output slots, lack of checking the strength of the object, using the Shift key, and crashing client. As a result, the player can put as many objects as he wants from the inventory into the exit slot, where it can harm and prevent many interesting mechanics from being implemented. Also, if the item in the output slot is damaged, you can repair it by taking the item along with the more complete item. This works if items can stack. This is another bug. Let me remind you that when interacting with a player's inventory, or with an entry slot, this is not possible. This is another bug. As a result, at the moment I can’t implement a mechanism that works with a single element from the stack, and also I can't interact with the strength of the elements if they are stackable. Don't open another ticket for this, if you reply to the ticket we can re-open it. Based on the details from your first post we assumed this ticket is complete. I have removed your duplicate ticket. I will check the issues you reported to see what can be done. Regarding items with damage, this is due to stack size being more than one. If the item has damage, it should have stack size 1. Thank you, thank you for your work. I will wait very much. Ps. 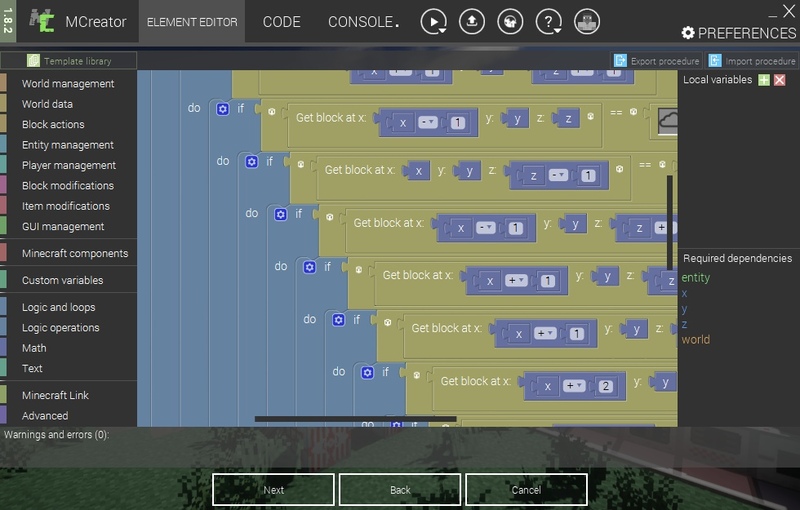 Mcreator also lacks a more variations of resolution for the application, or at least for the "logic" window, while working, sometimes the miniature Interferes for work window very much.